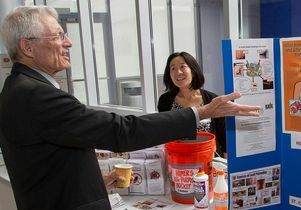 A dozen agencies attended “Los Angeles Innovates — Meeting New Demands for Access to Healthcare,” an event sponsored by the Institute for Innovation and Health at UCLA to share what many agencies and institutions are doing to help community residents. 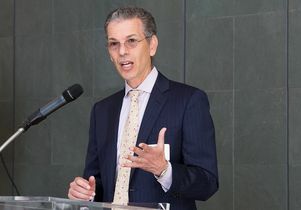 Dr. David Feinberg, president of UCLA Health System and CEO for the UCLA Hospital System, tells a gathering of health agency administrators and staffers that UCLA's goal is to share innovations in health care broadly. The event was held in the new Martin Luther King, Jr. Community Hospital in South Los Angeles, which is set to open next year and features a variety of innovations, including “smart beds” that alert a nurse’s mobile device if a patient lowers the rail on a hospital bed. Dr. Elaine Batchlor, chief executive officer of the new hospital, said she was proud to host the gathering as “innovation is the cornerstone of the work we’re doing to launch this hospital,” which is being opened in a partnership between the County of Los Angeles and the University of California. “We want to transform health care for the community, and we’re here to learn from each other the best ways to improve our operations,” Batchlor said. Molly Coye, UCLA’s chief innovation officer, stressed that if a program is working well at UCLA, for example, the strategy should be openly available so that health care agencies are not constantly reinventing the wheel. “What innovation is about is taking something new that is not widely spread and spreading it further,” Coye said, adding that one such innovation designed to make end-of-life better for the elderly also reduces health care costs by 30-45 percent. One such innovation shared at the event was UCLA’s Alzheimer’s and Dementia Care Program, which provides comprehensive and coordinated care and services for patients. A nurse practitioner develops an individualized care plan for each patient, with referrals to neurologists, psychiatrists and geriatric specialists for consultation and medication adjustments. The goal is to help caregivers navigate the health care system and avoid costly hospitalization and emergency room visits. The program has helped more than 700 patients to date, said Leslie Chang Evertson, a care manager in the program. Talking Survey and Tablet Health Coach by L.A. Net. This allows physician practices to collect and securely transmit survey data electronically from patients in their waiting rooms and provides individualized health education and coaching videos based on the responses to survey questions. Low literacy and non-English-speaking patients benefit from the surveys and patient education materials given to them on tablets and via headphones while they’re in the waiting room. Clinical Pharmacy Services Integrated into a Safety Net Clinic by USC and AltaMed. This program provides on-site pharmacist consultation for chronic care patients with diabetes, hypertension, asthma, heart failure and hyperlipidemia. Integrating clinical pharmacy services improves the health outcomes of chronic care patients and decreases high-cost emergency room visits and hospitalizations. eConsults by the Los Angeles County Department of Health Services and L.A. Care. This is a web-based, secure communication portal that allows primary-care practitioners to initiate and receive electronic consultations from specialists. The program results in a 20-40 percent decrease of in-person specialist visits and enables the safe peer-to-peer exchange of clinical information. Healthy Homes, Healthy Families from St. John’s Well Child and Family Center. This program provides holistic medical care, education and social advocacy to help children who suffer from illnesses such as asthma and lead poisoning as a result of slum housing conditions. The program provides clinical treatment for affected children and addresses conditions in the home environment that cause the illnesses. Heart Failure Automated Remote Monitoring System and Depression Automated Remote Monitoring System in the Los Angeles County Department of Health Services. These systems use automated voice-recognition telephone monitoring to track patients. For heart failure patients, it allows nurses to intervene before complications require a lengthy hospital stay. The system results in earlier detection, intervention and management of deterioration from stable chronic patients at a 95 percent lower cost compared to having nurses make the calls. For a patient with depression, it allows for monitoring and immediate intervention when necessary. The system frees up nurses to provide more direct patient care. Home Palliative Care developed with support from Partners in Care Foundation. This program provides multi-specialty teams to deliver home-based palliative care to patients who have late-stage chronic conditions and pain-management needs that often are addressed in hospitals. Care teams include physicians, nurses, aides, social workers and therapists. Inpatient Frailty Project by Cedars-Sinai Health System. This program identifies high-risk elderly patients once they’re admitted to a hospital and follows them with more in-depth assessment using clusters of risk factors found to be predictors of adverse events, extended hospital stays and readmissions. The program identifies and mitigates risk factors both in the hospital and in the home after a patient is discharged. Vets to Home: VA Project 120 by the VA Greater Los Angeles Healthcare System. Serving the severely mentally ill and chronically homeless veteran population, the program uses a “street to home” model that enables the delivery of comprehensive psychiatry, primary care, social work and transportation to medical appointments to address the needs of the veterans whether in their residences or on the street. VA Homeless Patient-aligned Care Team from the VA Greater Los Angeles Healthcare System. To reduce emergency room visits and hospitalization, this program brings primary care service to homeless veterans, who are high users of emergency room and hospital services. Community Health Detailing by HealthBegins. This program allows community residents to learn about and map resources and then update an online Yelp-like database to help clinics quickly find resources for patients with health-related social needs. In a pilot program with a South Los Angeles high school, more than 100 students mapped more than 500 local resources for use by community clinics.